My original plan was to run this race as my last training run. I would run it with Amy. Thereby guaranteeing I would not run it too fast. When Amy decided not to run, I looked for plan B.
Monday, I called my friend Keith and he said I could run with him. I knew he would run faster that I wanted (under 2 hours) but I figured it would be a good training run even though it was a little late in the training for a tempo run. Got up before the alarm went off at 3:30 Saturday morning. Got ready and was parked at LP Field a little after 5. It was already warm. I didn’t need any extra clothing to stay warm while I waited. Caught the bus to Centennial Park. Todd and Jeff from the running group from my church were on the same bus. There was some trash talk that got a few laughs from the folks on the bus. It doesn’t take much to get folks going at that hour of the morning. Headed to the “tree house” at the park that Amy and I waited in last year. There was no one there this year since there was not a need to stay dry. It was a good place to sit and relax. It was a beautiful Spring morning with the temperature in the lower 60s. The big discussion of the morning, though, was how hot it was going to get. Since we have and a cool wet Spring, Saturday was the first 80 degree day. Normally, that would not be a problem. But without any time to acclimate, it was a concern. Found Keith and friends. 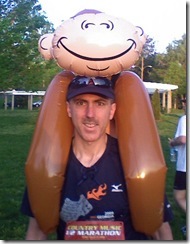 Keith’s brother-in-law, Chris, wanted to run with a money on his back. You can imagine the looks and the comments we got as we waited in the corals to start. One of things I enjoy about this race is that is is such an event. With 30,000 runners, the start is really something to see. Runners as far as you can see. We all lined up in coral 5 and waited for the start. The course was changed to include more of downtown but in doing so, they add several more hills. Keith wanted to run under 2 hours. So I just stayed with him. The first couple of miles were too fast for me but we began to get back to more realistic pace on the hills on miles 4 and 5. Around mile 7, Keith said that he had a side stitch and need to walk for a bit. He told me to go on and that he would catch up. I was on my own, Plan C.
By this time we were heading up Belmont and the heat was kicking in. I seemed to set in around a 8:50 pace. I didn’t push it. 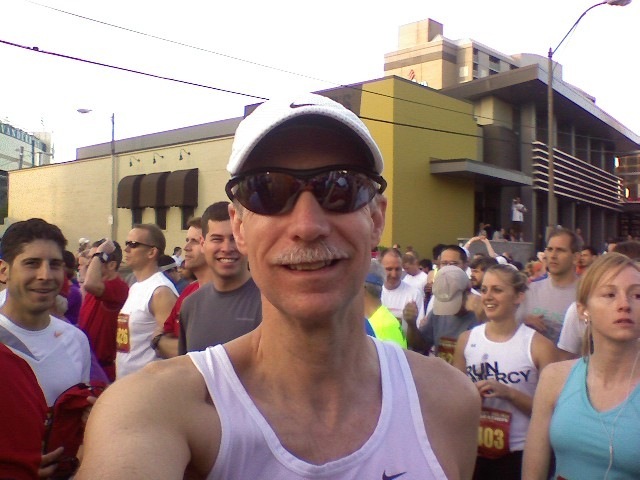 Just ran what felt comfortable knowing that the real race is next weekend in Cincinnati. 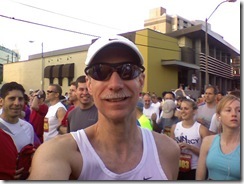 When I got to where the half marathoner and the marathoner’s split, I was glad I was only doing the half this year. As I headed toward the finish, I saw several folks cramping up. About 200 yards from the finish line, one guy grabbed his hamstring and limped to the side of the road. I was glad I was finished, 1:57:56. I waited around after the race for Keith. He finished about 5 minutes behind me. Came home and took an ice bath to start the recovery for the Flying Pig Marathon next Sunday. A friend at Church this morning who has run the Half several years made the comment that this year she felt like she was constantly running up hill. I agree. I am stiffer today than I should be for only running 13 miles. Hope the recovery is quick. 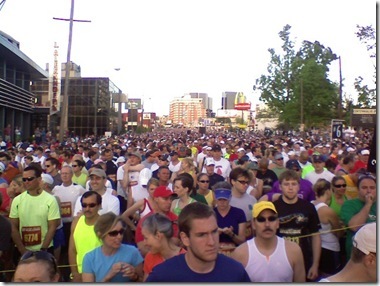 This entry was posted on Sunday, April 26th, 2009 at 5:04 pm	and is filed under Race Reports. You can follow any responses to this entry through the RSS 2.0 feed. You can leave a response, or trackback from your own site. Nice race, David! This will be quite an interesting experiment, to see how a solid HM 8 days before a marathon affects you. And yeah, plan C did happen for you…way to flex. My guess is that the hill work will help you in the first next week…some big climbs in that portion of the course. How did the ice bath work? I know that getting in a cold pool helped me recover big time from pacing Bob last October, but I’ve never had the guts for putting ice in a bath tub. Nice race – you splits look very even when you match it up with the elevation.. looks like you locked in to an even effort. You will do great on Sunday!! Good luck! 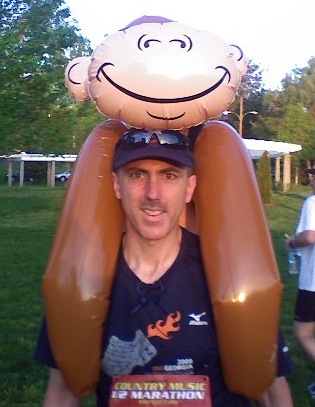 Oh – how did Chris do with his monkey? Seems to me that it would rub the inside of his arms! Way to go David. Sorry I missed you at the expo. I hung around for quite a while but ended up chatting my head off and feeling guilty about not being at work. You did great at the 1/2 this past weekend!! Didn’t look like the heat affected you much considering not being acclimated! WOW…have fun at the Pig and tell the FF Cincy (Jeremy and Susan) folks I said hello!! Cannot wait to hear how that race goes. Good half, David. It will be interesting to see if and how it affects your marathon. Ice bath feels great AFTER you get out;) Really seems to make a difference the next day. Good luck at the Pig this weekend! That is such a fun race!!!!!! Maybe we’ll run into each other at the Y next week, eek!! !